We all live busy lives. We have to juggle family, work, and everyday life. Sometimes we get caught in the whirlwind and we forget common items – like our lunch from the fridge before walking out the door, or in a hurry you bolt out of the office to see your son or daughters game, and you forget to eat. We’ve all been there. We don’t have to throw our hands up, or worse, give up on our health goals. Things happen. However, there’s something that has been proven useful when we find ourselves having a “doh” moment – Lean Body meal replacement shakes. We live in a nation where obesity is taking the population by storm. With over 60% of adults being categorized as overweight, and over 30% of that number being considered obese. This causes many different health problems both in the short-term and the long-term. Our nutrition tends to get thrown to the wayside and convenience foods such as chips, pretzels, candy, cookies, and other unhealthy options are consumed. Do we know better? Most of us do. But it’s so much easier to eat something that is already made or comes pre-packaged. How many of us stop by to pick up a cup of coffee on the way to the office? Do you sometimes also grab a donut while there? We’d bet many of us are nodding our heads yes. So, why do we pick up that donut (other than the fact that they taste delicious)?… Convenience. It’s there, it tastes good, and seems inexpensive – right? The same can be said about vending machines. The majority of what we find in a vending machine isn’t healthy and doesn’t provide the nutrients needed to fuel our bodies. 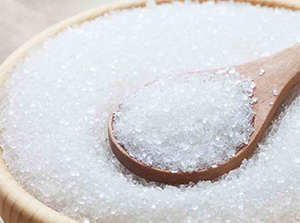 Sure, we might get the initial spike in energy from the sugars found in many of those options, but like a roller coaster, what goes up also comes back down (and quickly). They are low-quality items that are generally high in calories. It should go without saying, but we should also touch on the sugar aspect of many convenience options. Looking at the nutrition label you’ll find the majority of the food items are high in sugar. Sugar to the brain is similar to a drug. When it has it, it wants more. And when the brain doesn’t have it, we can suffer from brain fog, a drop in energy, headaches, and a decline in overall productivity. 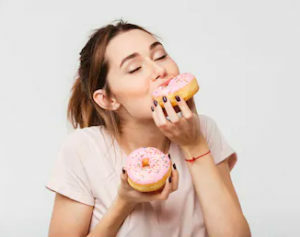 When we consume sugar and have those ups and downs in energy and mood, many of us tend to find ourselves going back to those same poor choices to boost our energy. See where this is headed? This becomes a vicious cycle and for that reason, it’s important to find a healthy option when we are in a pinch and want some food. For starters, it’s important for us to have a clear picture of our own unique health goals. Sure, we’re all trying to fight off the hunger, but what about the foods we consume on a daily basis, what’s the purpose or reasoning for our choices? 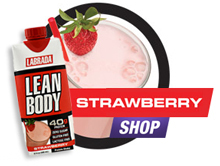 Are you trying to add quality lean muscle mass? Or maybe you’re trying to lose some weight and drop body fat? These are all factors we should take into consideration when trying to eat healthy and fuel our body. 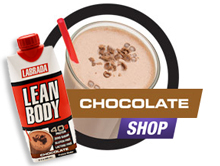 Meal replacement shakes can save you time and hassle. Being a business professional and/or parent is hard, and you may seem to always be on the go – but you can do it without reservation. Even if you love your life, sometimes life still decides to throw you curveballs. And when that happens, meal replacement shakes are a great way to stay in the batter’s box, keep swinging, and knock it out of the park. Plan meals ahead! And as with many goals in life, when you plan ahead, you can overcome the daily curveballs. 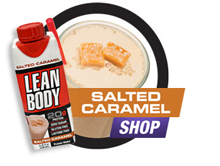 For that reason, many people have started strategically-packing meal replacement shakes. Keep one in your desk, one in your car, one in your briefcase, and a healthy supply in your refrigerator at home. What will this allow you to do? Well, anything you want, while knowing that you have great nutritional choices with you at all times. While whole food meals are always preferable, having a backup plan is an awesome strategy. Simply having the convenience of meal replacement shakes at your disposal allows you to run from meeting to meeting, squeeze in an extra meal in the car after a workout, and play Super-Dad (or Mom) with your kids. There are various options available on the market. Labrada, however, makes Lean Body RTD (ready-to-drink) meal replacement shakes in TetraPak cartons that contain 20 grams of protein or 40 grams of protein. 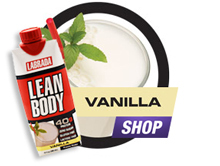 The Lean Body shake you choose should be based on your own nutrition and lifestyle goals (like what we touched on earlier). The 20-gram variety will provide you with 140 calories, 4.5 grams of fat, 4 grams of carbohydrates, 2 grams of fiber, and 0 grams of sugar. The larger 40-gram version will give you 280 calories, 9 grams of fat, 9 grams of carbohydrates, 5 grams of fiber, and 0 grams of sugar. 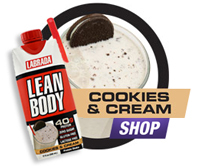 Regardless of which you choose, all of these Labrada varieties taste amazing and are also gluten free!